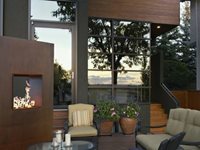 Dreamt up by a husband and wife with a background in landscape design and construction, these outdoor fire features are stunning, practical and green. They are handcrafted in Colorado using recycled steel and wind energy, so you can rest assured that you are getting a one-of-a-kind, eco-friendly piece. 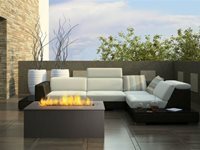 A versatile outdoor fireplace system, the Regency Plateau provides a stylish complement to outdoor living areas. It is available in complete kits or just the hardware to be incorporated into a custom installation. This fireplace design, appropriately dubbed Modfire, is both beautiful and durable. Handcrafted by a metalworker, marshmallow lover and father from Phoenix, these fireplaces are available in natural steel, bright blue, deep red and orange with avocado and yellow coming soon. 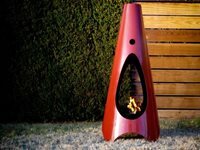 They are designed for burning your favorite wood or composite fire-logs, but their creator recommends chiminea chunks for the perfect fire every time. 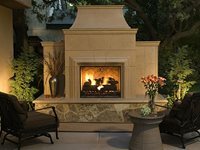 Designs by Garry offers well-designed, precast fireplaces that will make a great addition to any backyard. 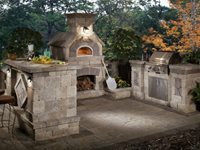 The outdoor fireplaces, made of glass fiber reinforced concrete, are available in seven styles. For the finished models, you can choose from a variety of colors and textures. Contractor's models are also offered so that you can finish it your way with stucco, veneer, or even faux painting. The fireplaces are designed to burn propane or natural gas. An additional fee is charged for shipping outside of California.